Our couple, Theresa and Jens, got married in 2015. 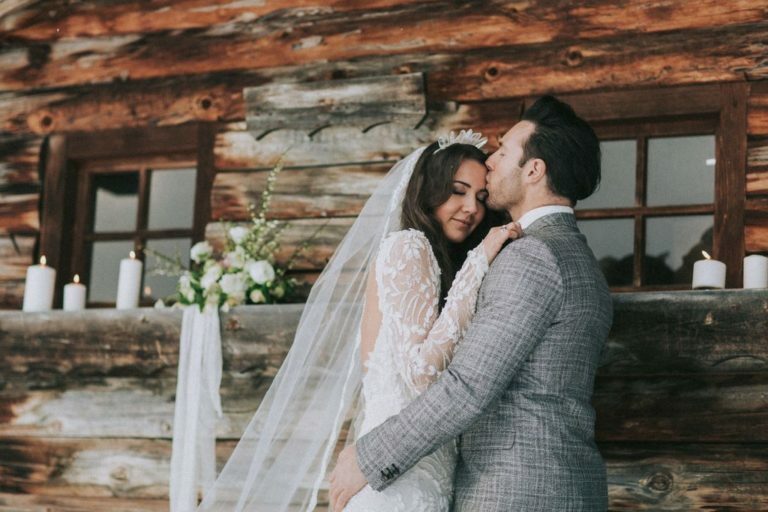 They shared this special day with all of their loved ones, but they always wanted a private getaway – just the two of them. 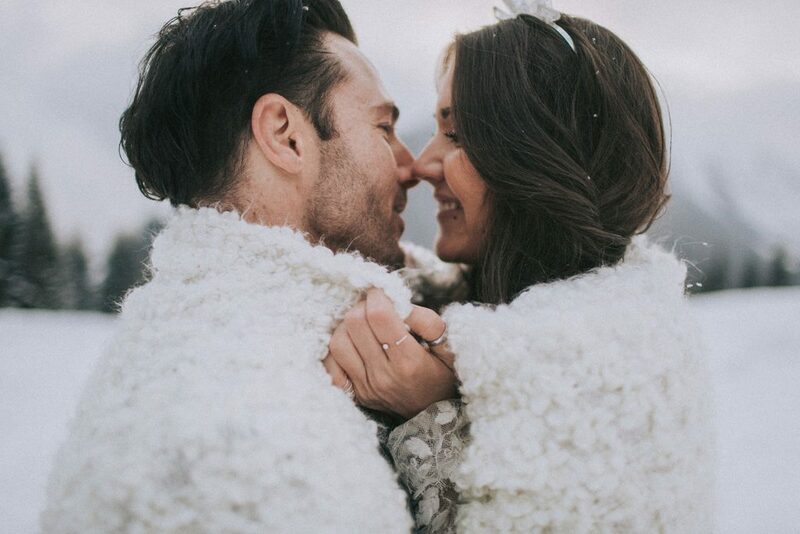 Since a confession of love is always something intimate and emotional, the couple wanted to do this winter elopement in a very private and romantic location without any audience. 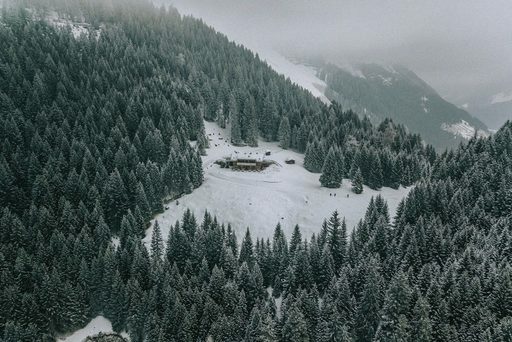 To create the desired personal and cozy atmosphere, there could not be any better place than a wooden cabin on the top of a snowy mountain in Austria, right? 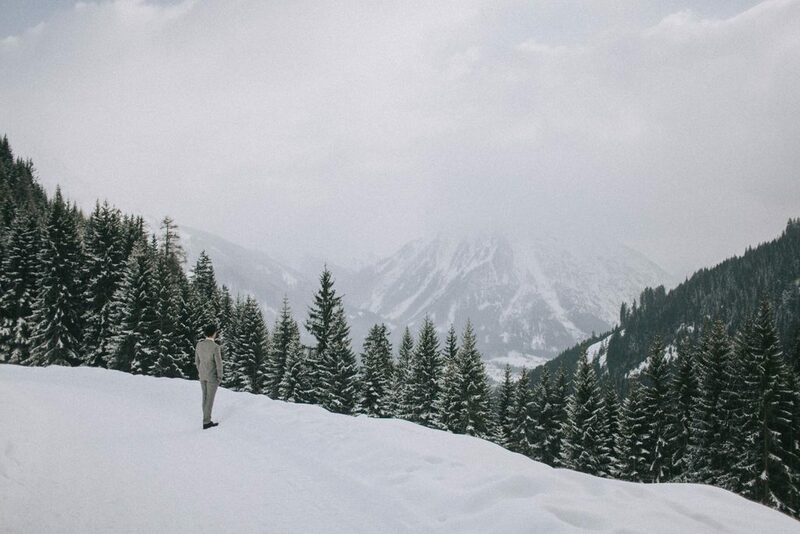 The wintertime always has this cozy atmosphere and the landscape in the Alps is breathtaking. 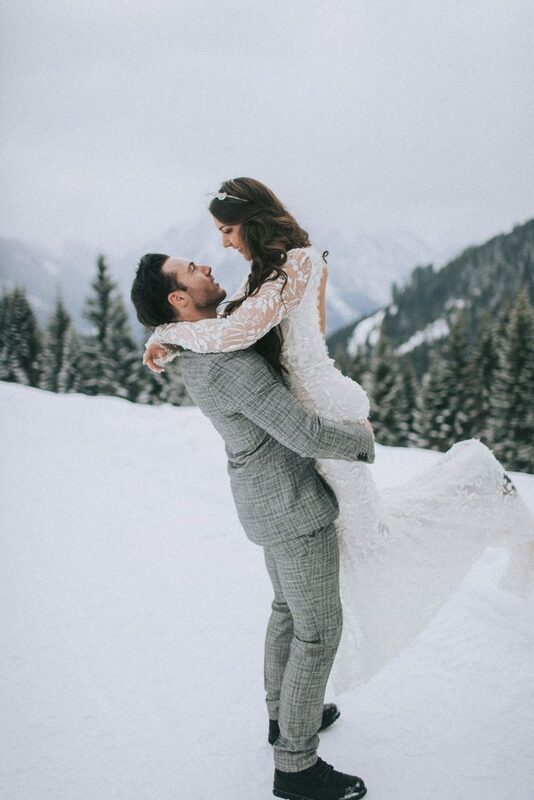 Standing on top of the mountain, admiring the stunning snowy piece of earth and sharing this experience with someone you love is definitely a moment you’ll never forget. 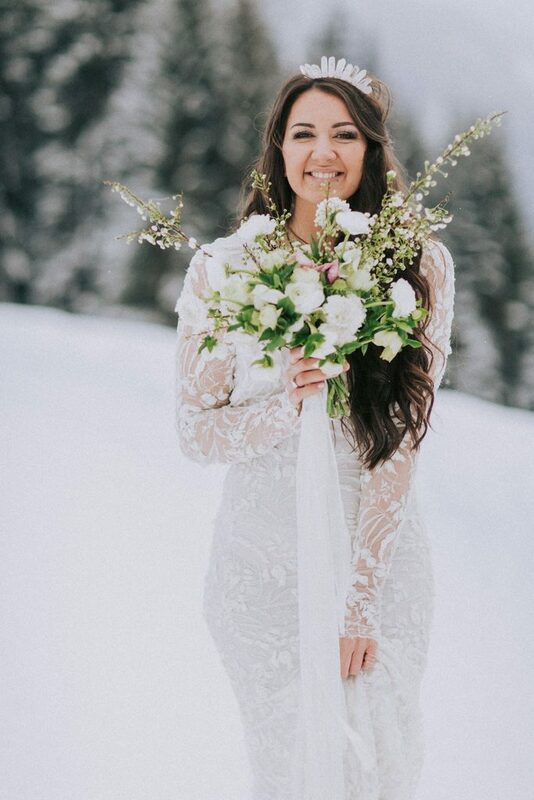 If you are planning a private getaway with your partner or cannot wait to tie the knot in a winter wonderland, then you should check out this winter inspiration shoot, too! 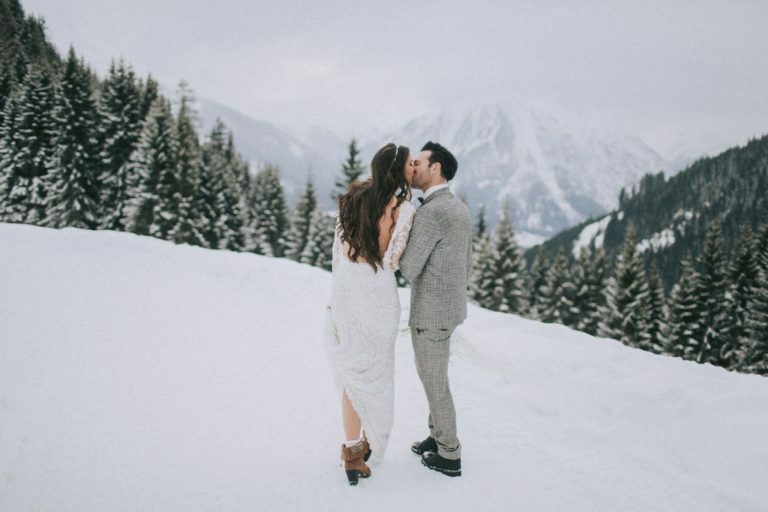 Looking for a winter wedding outfit? 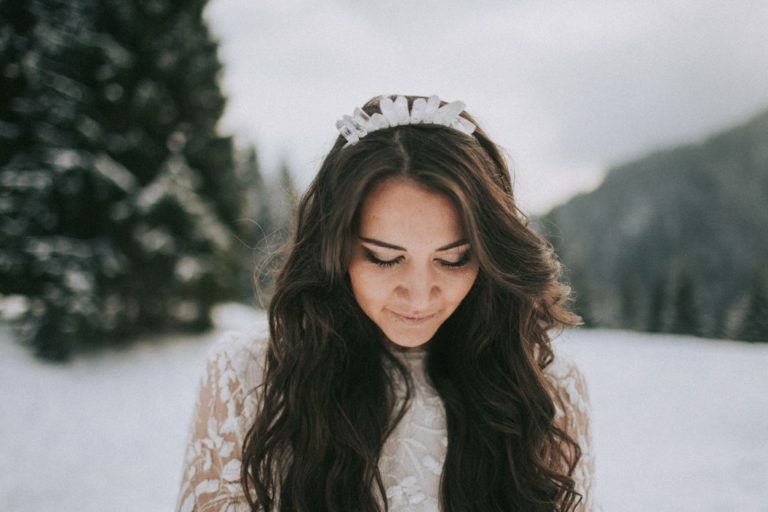 Then take a look at our styled shoot, where we show you a modern winter princess look. 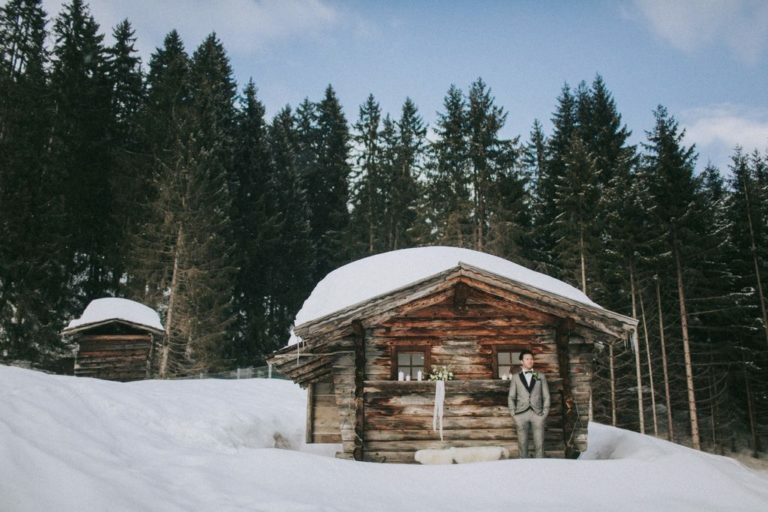 The perfect elopement location was found with this beautiful rustic and romantic wooden cabin. It is located in the Austrian Alpes and lays on top of a mountain for just the right amount of seclusion. The way up to this spot is pretty adventurous. Small and curvy roads lead up to the cabin. 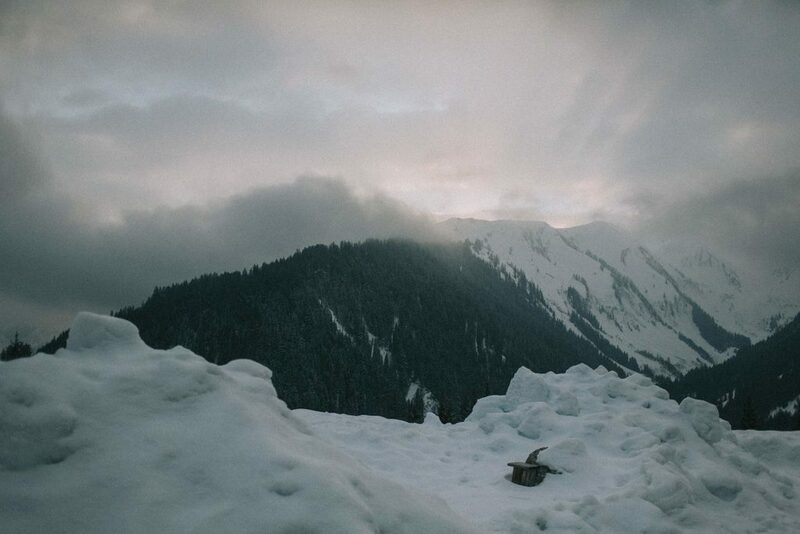 It it both quaint and thrilling, since a feeling of solitude is also present. 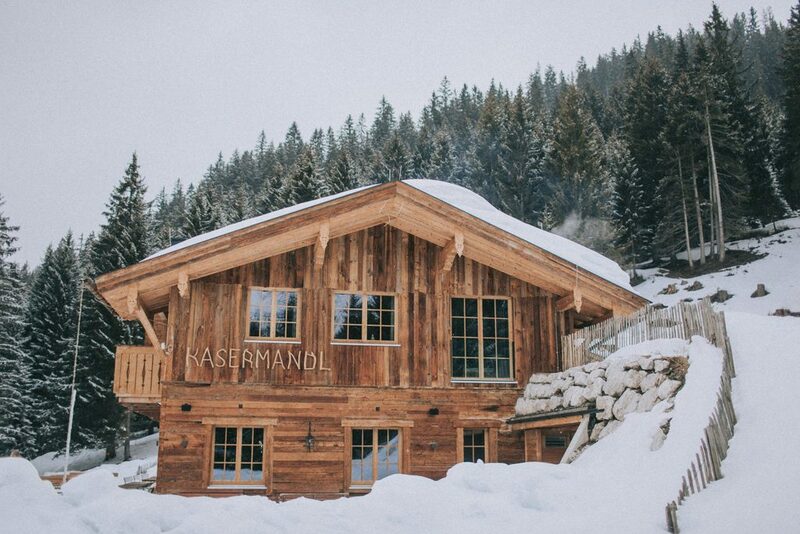 Kasermandl is a really romantic place and the warmth it radiates matches the couples aura. Hence the wood, it is cozy and rustic. 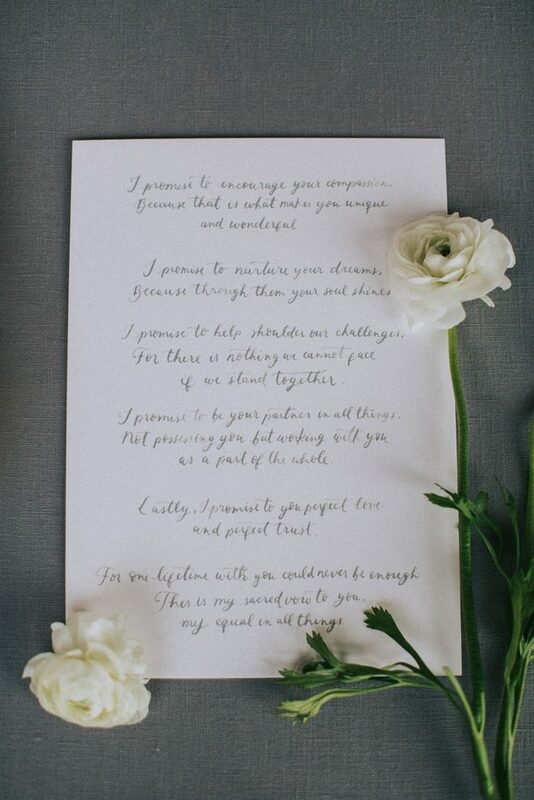 It is perfect for an intimate winter wedding or a winter elopement. A once-in-a-lifetime experience is granted, because of the stunning scenery and the spectacular view. The cabin has a fireplace where you can warm up after you had a blast in the snow. The rustic interior fits to the outer appearance of the lodge. 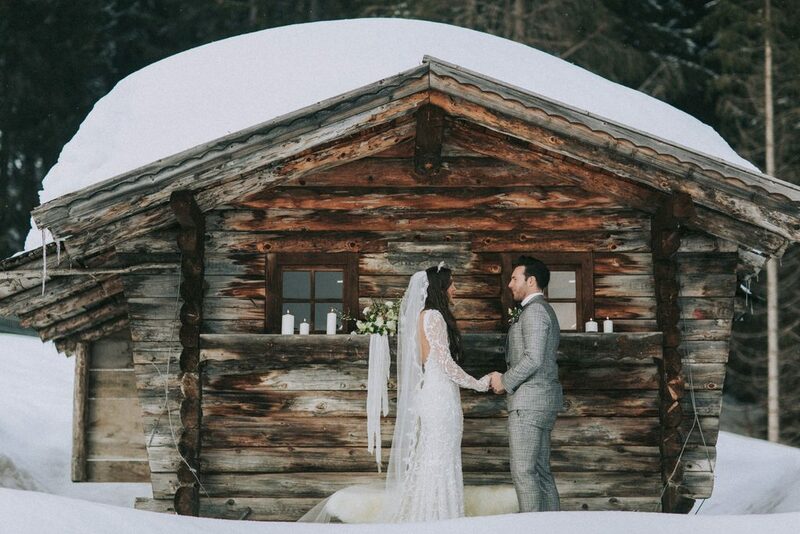 The styling of the bride and the groom for this winter elopement had to be warm and festive. 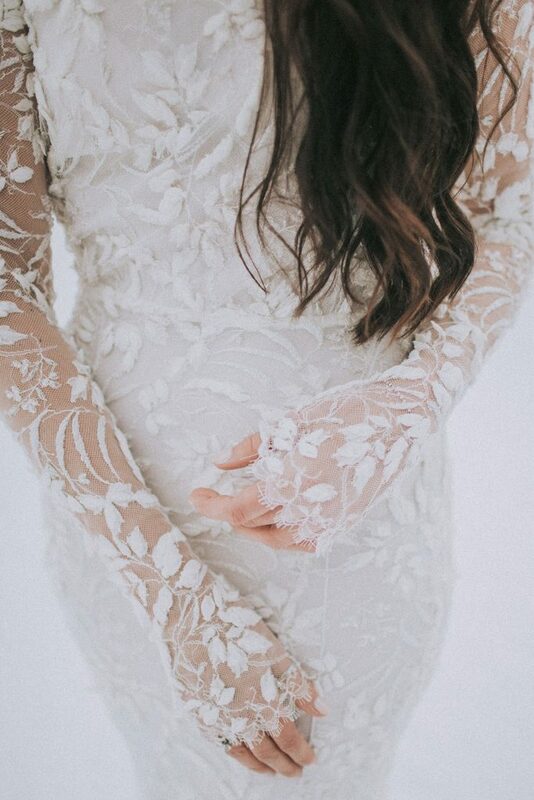 Therefore, the bride is wearing a beautiful dress from Lana Mueller with long sleeves and gorgeous lace all over it. The highlight of this dress is definitely the low back neckline. 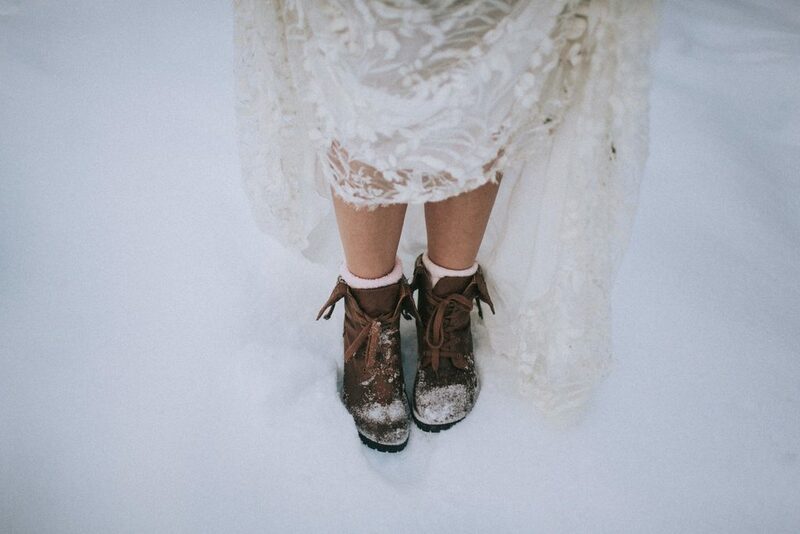 Rustic brown mountain boots are more weather appropriate than other bridal heels and go with the rustic location. 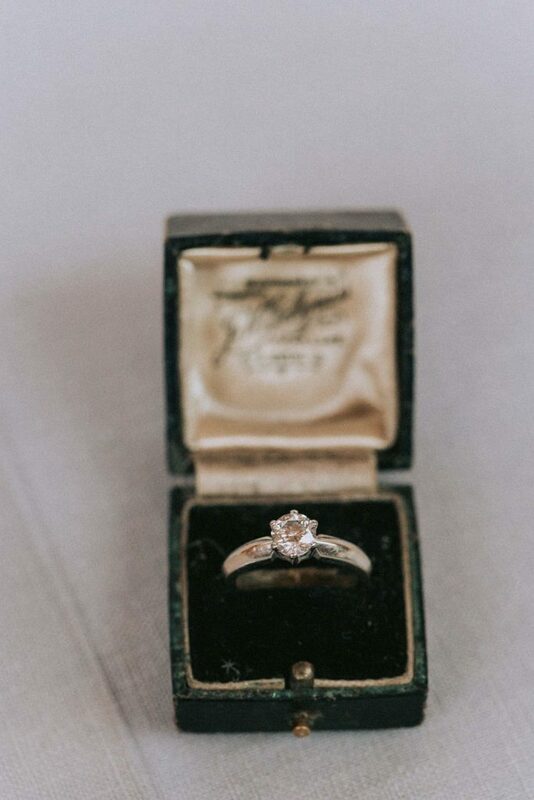 The bride’s jewelry is made of diamonds and berg crystals. Moreover, the headpiece is a beautiful crystal crown which reminds of ice and snow. 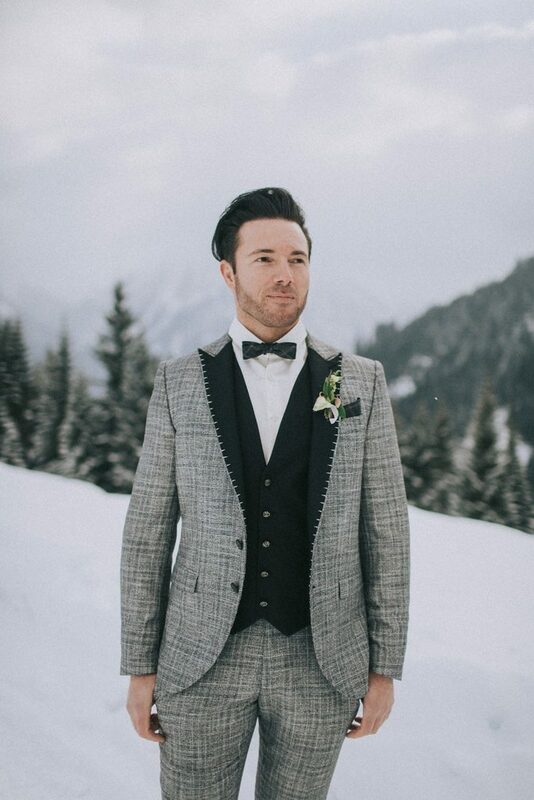 The groom is wearing a unique grey suit from Lo & Go made of tweed. 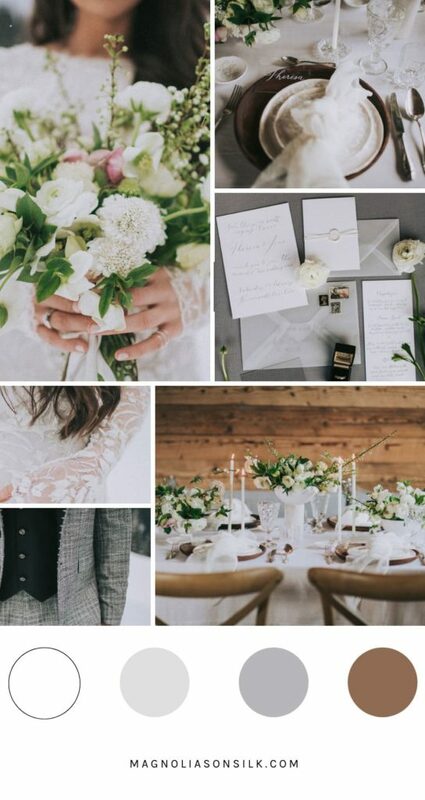 Tweed is a warm fabric so it is great for winter weddings. 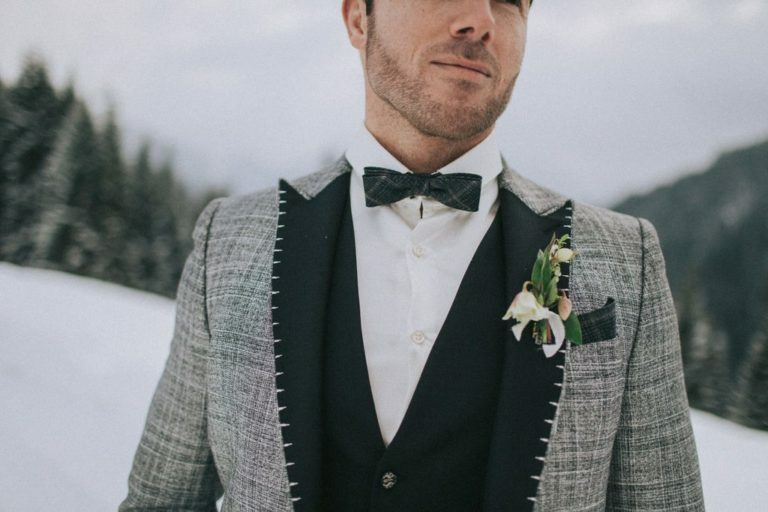 The mixed colors of white, grey and black make this suit really fascinating and special. His bow tie is also made of tweed to match the rest of the outfit and the black vest is also very chic. In the logde, the couple was having a dinner. The table decoration for this winter elopement had the motif of ice and snow, just like the jewelry of the bride. 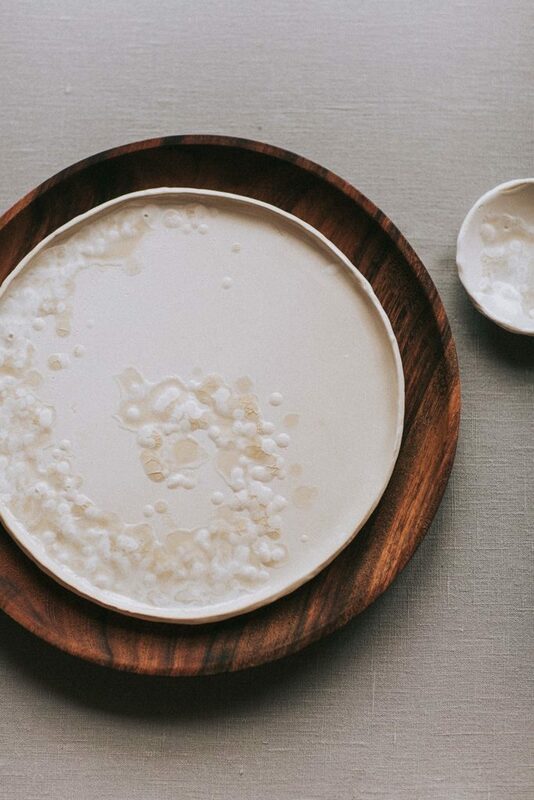 Crystal glasses and handmade ceramic plates with an interesting glaze that reminds of snow really capture the atmosphere of the surroundings. 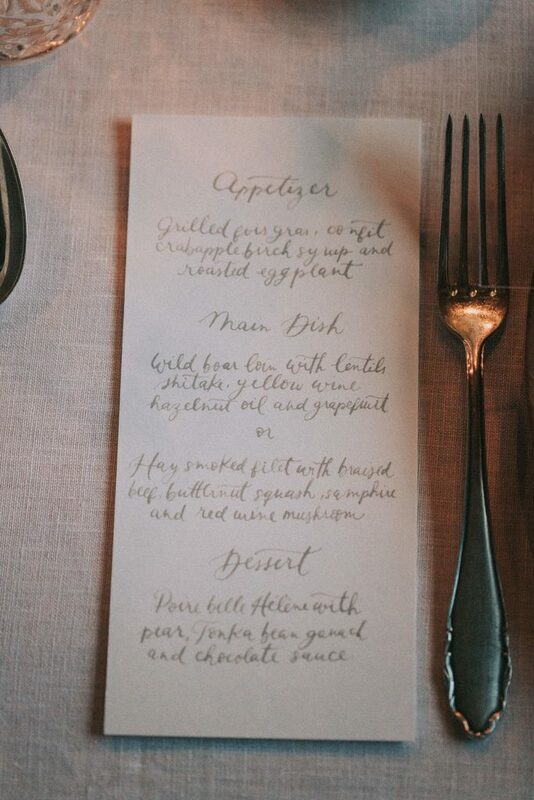 The centerpieces come in an all white look. 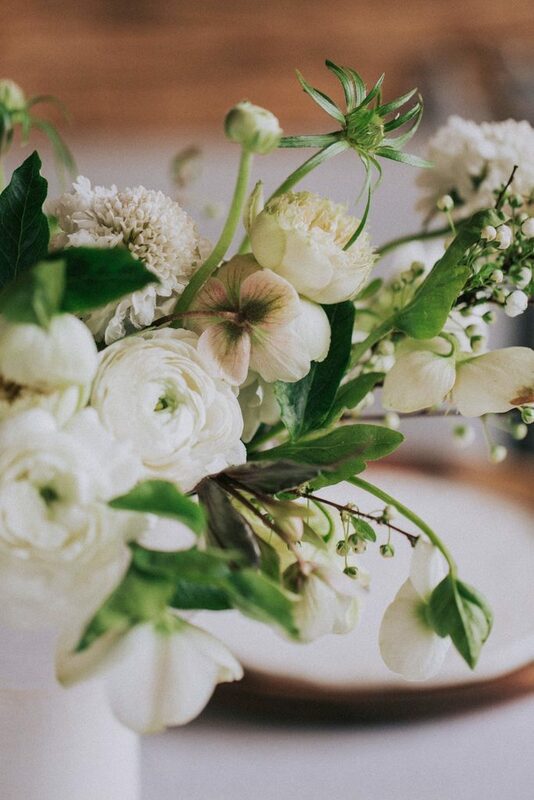 White helleborus, white ranunculus and plum twigs with small and delicate blossoms. 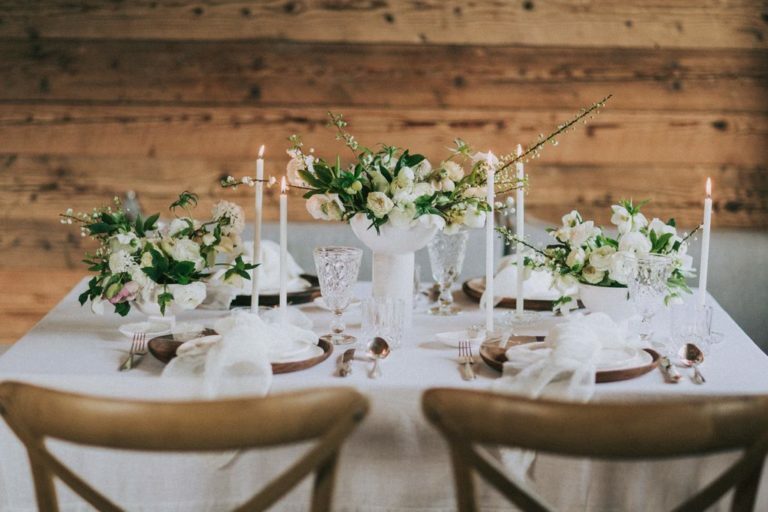 Overall, the neutral color palette comes in muted tones like white, off-white, grey and earthy tones to get the connection to the rustic wood of the cabin. Silver is the accent color and it was used in the cutlery and jewelry. 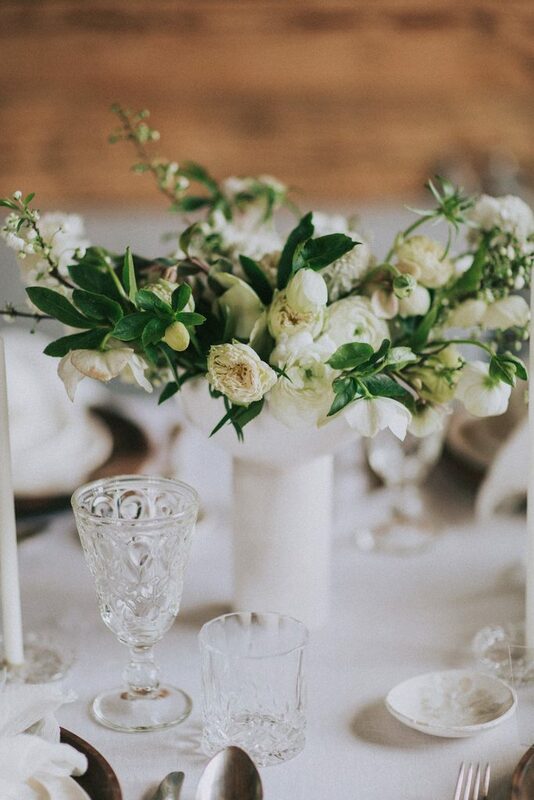 White napkins made of silk and a white linen table cloth make the table decoration complete. 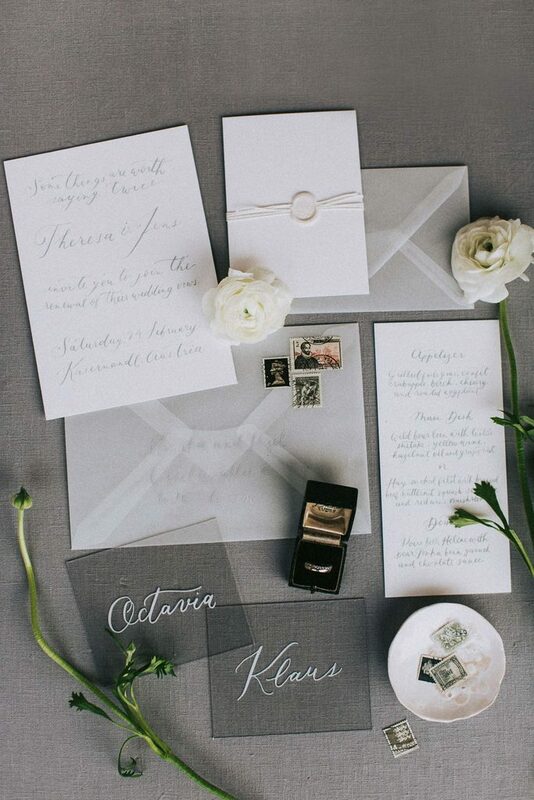 For the stationary for this winter elopement, the motif of ice and snow continues. Ice crystals are portrayed in the transparent paper. 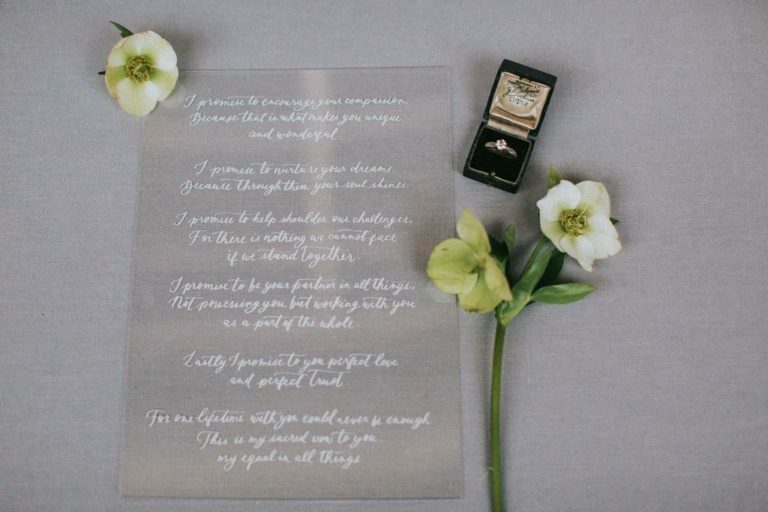 A calligraphy in a really light grey appears frosty and romantic. 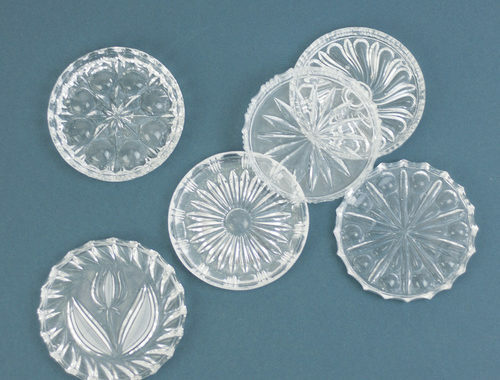 The white wax seals remind of soft snowflakes. 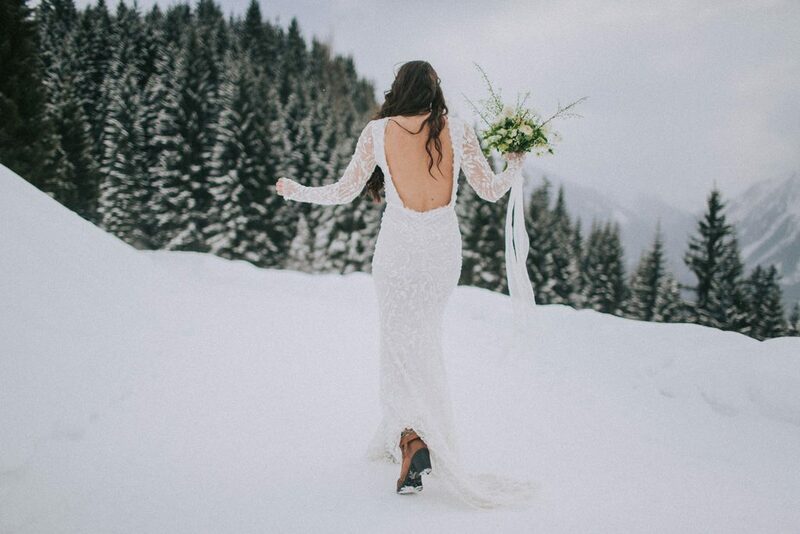 Planning a winter wedding can be a huge challenge. 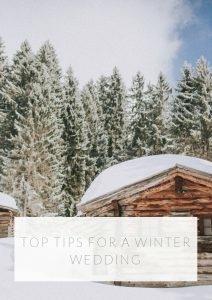 With our top tips you can master it. Want us to share it? We do it in this guide – a free 5 page-download we have made just for you. The FREE guide will be with you in a jiffy!